For some reason, writing the Name Series has left me mentally exhausted. This week, I just going to give my brain a break and keeping it simple for introducing a Picture Week. Like they say, a picture speaks a thousand words. Perhaps, photographers are more efficient writers than we are. Go figure. 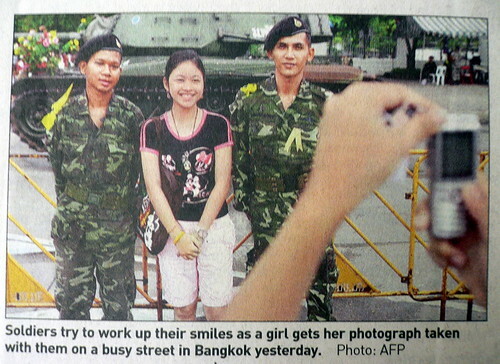 "For some Bangkok residents, Tuesday's coup proved to be a little more than a source of entertainment." - SCMP 21 Sep 2006. I believe that the children are the most powerful people in the world. They are the ones who would shape the future of the world. They have tears that can drown a thousand souls as well as a smile that can melt a million hearts. 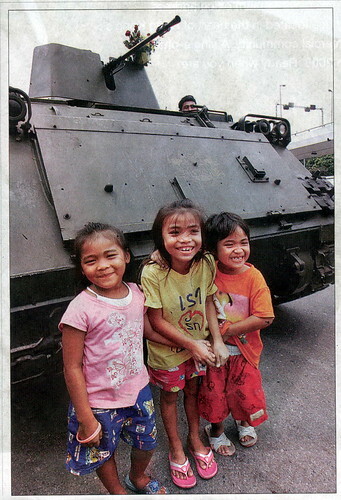 Anna: They were saying that this was by far the friendliest coup in the history of Thailand. I am just glad no blood was shed in the process. i think its always pretty volatile if a country allows its military to take political sides. but then, i can see why the ppl are much happier being in the hands of the military, it's either that or rely on a corrupt police force. probably more safer in the streets now than ever. Akk: Well, apparently during this coup, the Police were involved alongside with the military. Ah..why got password for the name series?? I want to readddd. Please? xcake: Go check you tag board on your own blog. ok?